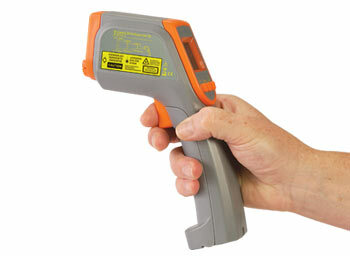 The OS418L is a fully functional infrared non-contact temperature measuring device and hygrothermometer. OS418L monitors humidity 0 to 99% RH. This unit offers laser sighting and adjustable emmisivity. The display is user selectable for infrared or humidity readings. Long battery life (typical 180 hrs without laser or backlight), is obtained from 2 “AAA” batteries (included). The 12:1 field of view measures small and distant targets. 참고: Comes complete with 2 "AAA" batteries, laser circle to dot laser sighting and operator’s manual.